Since I’ve grown up in Pittsburgh my entire life, I knew that UPMC has always given back to the community. It wasn’t until I started working here, though, that I truly grasped the incredible amount that they give to the Pittsburgh area! In both of my years as a Summer Associate, it’s been extremely obvious the extent to which UPMC values community outreach and partnership. This year, I had the honor of being the ISD Summer Associate Service Chair this year. 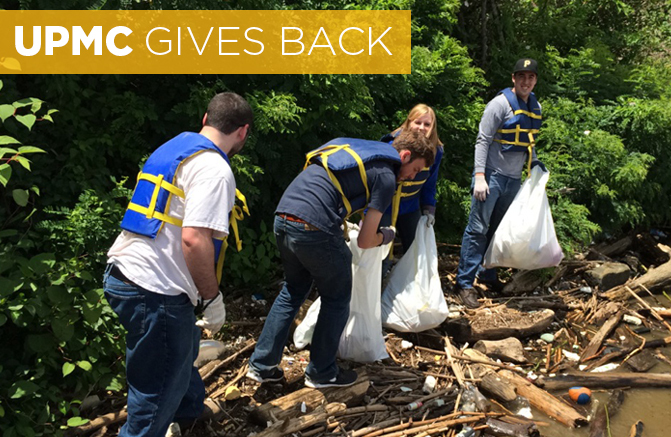 For our project, we joined forces with the Allegheny Cleanways organization for the day. Allegheny Cleanways is an organization that helps clean up the Three Rivers Heritage Trail by weeding, picking up litter, and just improving the overall appearance of the trails for all runners, bikers, and walkers. We also had the chance to use their boat on the river to clean various locations where trash had piled up. We continued cleaning the river front and tried to make our city as beautiful as possible. This event helped foster relationships between both the ISD Summer Associates and the ISDR Associates. We were able to all work together, talk about work, and genuinely become friends with each other. It was a wonderful day allowing us all to take a break from the cubicle life and give back to the community around us. For those interested, more information on Allegheny Cleanways can be found, here. The best advice I can give to anyone who is thinking about taking this position or even working for UPMC is not to assume that your entire time to be spent just doing work in a cube. With this company you will and need to put effort into improving the community around you! UPMC gave back over $800 million to the community last year and every year this contribution continues to grow. For reasons like these, I cannot think of a better place to work than UPMC.